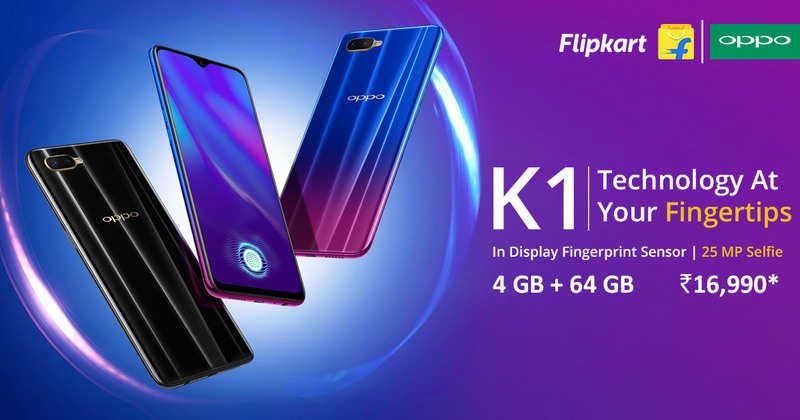 Earlier this week, Oppo K1 has been launched in India and now the smartphone goes on sale for the first time in India. It would be available only at Flipkart and the sale is scheduled to start at 12 PM noon. In India, the Oppo K1 comes with a price tag of Rs 16,990 for the single 4GB RAM and 64GB storage model. The customers can choose among Astral Blue and Piano Black color options. The interested customers can avail the no-cost EMI options for the period of 3 or 6 months on the purchase of Oppo K1. Flipkart is offering a Complete Mobile Protection plan at just Rs. 499. Interestingly, Buyback guarantee option is also available wherein the users will get a 90 percent buyback value on the Oppo K1, amounting Rs 15,300. The buyback guarantee option is available at just Re 1. It can be valid only when the user will exchange the Oppo K1 with another Oppo smartphone during 8 months of purchasing the device. As expected, the Oppo K1 has been launched in India on February 6, 2019. It comes with an under- display fingerprint scanner and Hyper Boost technology for gaming- based experience. The key attractions of the device include water drop-shaped display notch, 6.4-inch display, protected with Corning Gorilla Glass 5, dual rear cameras, gradient finish on the rear panel, 25MP selfie snapper coupled with AI-powered capabilities. To recall, the Oppo K1 was initially launched in the China market on October 10, 2018. The Oppo K1 boasts a 6.4-inch FHD+ screen panel with waterdrop display notch. The smartphone offers 19.5:9 aspect ratio, 91 percent screen-to-body ratio, screen resolution of 1080x2340 pixels and 430 nits peak brightness. The device features a 3D glass design and under-display fingerprint sensor which unlocks the smartphone in few seconds. It runs on Android 8.1 Oreo- out- of- the- box layered with ColorOS 5.2. Under the hood, the Oppo K1 is powered by a Qualcomm Snapdragon 660 coupled with Adreno 512 GPU which clocked at up to 1.95GHz. Currently, in India, it is available in 4GB of RAM and 64GB internal storage and it is being speculated that the 6GB RAM model would be launched later in India. In terms of lens, the Oppo K1 packs 16MP+2MP horizontally positioned dual cameras on the rear panel. For selfies and video calling, the smartphone gets a 25MP front-facing cameras accompanied by scene recognition and AI Beauty Mode. It is armed with a 3,600mAh non-removable battery. The connectivity options on the Oppo K1 include Dual-SIM 4G VoLTE, Wi-Fi i 802.11 a/b/g/n/ac, Bluetooth 5.0, GPS/ A-GPS, a micro USB port, and a 3.5mm headphone jack. The smartphone has been equipped with an accelerometer, gyro, ambient light and proximity sensors.